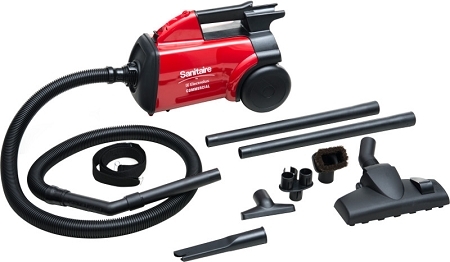 Our proven Sanitaire canister is compact, powerful and features telescopic metal wands to reach those difficult cleaning locations. CRI Green Label certified and available HEPA filtration makes this the perfect detail cleaner. At 10 lbs and less than 20" long, this proven canister can get into hard to reach places where almost no other cleaner can go. The 12amps of power and black metal telescopic wands take on dirt from floor to ceiling and beyond. The 20-ft. cord and the onboard tools mean fewer stops to plug/unplug and search for tools while cleaning. HEPA filtration makes this a perfect detail cleaner. Dust Capacity 2.6 dry qts.